Over the weekend BP learned that its latest effort at stanching the Deepwater Horizon oil spill — placing a huge metal dome over the leak — had failed. 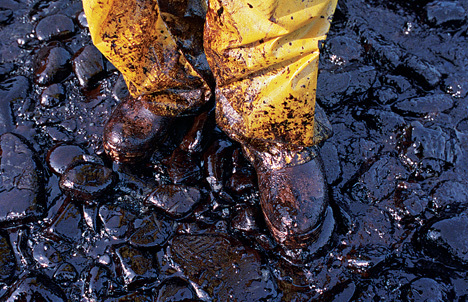 With the oil slick now washing up on the Louisiana shore, the Op-Ed editors asked five experts for their thoughts on what should be done now — and how we can avoid future catastrophes…. As Shell’s then top U.S. executive traveled the country, he discovered how corporate leaders create their own reputation for arrogance — and lose their chance to deliver the right message. This article, by a former president of Shell Oil, was written before the Deepwater Horizon explosion on April 22 and the subsequent oil leak. It is adapted from a book by the same name to be published May 25 by Palgrave Macmillan. On a brilliant blue sky Saturday morning in August 2006, I found myself in Erie, Pa. At that time (I have since retired), I was the president of the Shell Oil Company — the U.S.-based operating company of Royal Dutch/Shell, and itself one of the largest oil companies in the world. I was conducting an outreach tour. We had started the tour after Hurricanes Katrina and Rita hit the Gulf Coast in the late summer of 2005, just months after I became company president. Oil prices had been climbing for the past three years, and the serious supply disruptions caused by the storms sent them skyrocketing. I started receiving hate mail, including a drawing showing me hanging in effigy; not ex­actly what I expected when I took the job. Moreover, most lawmakers were ignoring the critical issues in energy: the need to guarantee affordable supply from as many sources as possible, to take climate change impact (and other emissions problems) seriously, and to safeguard energy security…..
John Hofmeister is quoted in The Sun UK Online discussing the coming fuel crisis in the UK. A FORMER boss of SHELL yesterday claimed the UK is in “big trouble” over future energy supplies. John Hofmeister said ministers had failed to build new nuclear power plants or develop ways of taking advantage of our coal reserves. He blamed the Government for an “unwillingness to tackle the big problems of energy supply”. Instead, decision makers had opted for “weak and anaemic alternatives”. His comments came a day after UK energy regulator Ofgem warned that Britain will suffer an energy crisis in just SIX YEARS – with power cuts during peak times. Mr Hofmeister, who was Shell president in America and has written a book, Why We Hate The Oil Companies, said: “I’m in favour of wind energy but people don’t know how many turbines will be necessary to achieve the goals of our elected officials. I’m a backer of wind, solar and biofuels as new, high-technology future contributors to the energy supply of the nation. Facing the daunting demand forecasts of the medium- and long-term future, the nation will need all the energy it can produce from every available source. Today’s seeming abundance of energy is a recession-driven aberration from the continuing rise in postindustrial, electron-dominated energy requirements in this century. Companies, institutions, governments and homes are run by information systems and countless electrical devices. When transportation also demands electrons, watch your meter spin! Yet public officials from the president and vice president to Cabinet and congressional leaders insult our intelligence by delivering scripted messages that the future of the new energy system in this country is clean renewable energy that will be delivered by countless so-called green jobs. The fake chimes of energy independence echo up and down Pennsylvania Avenue. Do headlines make truth, regardless of content? What is it about organizations like Repower America and the Center for American Progress, which provide ideology, not substance, to the administration and congressional leadership on the so-called new energy system? Why are their conclusions unchallenged? Is it ease of messaging, for who can be against clean and green? Is it to run away from hard choices about hydrocarbons and nuclear energy? No one’s against cleaner energy. But is it material? Is it affordable? Can it deliver commercial, ample new energy to the ever-aging existing energy system? Let’s be honest. It’s incremental and expensive. The American people, if sometimes late, are eventually pragmatic about energy hype without substance. Wind and solar don’t reduce the electric bill; biofuels don’t reduce gas prices. Misinformation and disinformation lead to communications bankruptcy. I told Sen. Barack Obama he needed a hydrocarbon plank in his presidential energy platform to deliver affordable gasoline. He responded that, as president, he would do biofuels. I said I’m doing biofuels (at the time as Shell Oil’s president) but not materially by 2012, or even 2016. He said we’ll do biofuels. I asked, with what subsidy? End of conversation. Clean and green, the energy system we aspire to, is subsidized like no other energy source in history. By whom? Us, and our progeny. All energy has historically received some type of public support to even out the volatility of high and low price cycles. The Energy Information Agency of the U.S. government’s Department of Energy reports that, for 2008, natural gas was subsidized 25 cents per megawatt hour of electricity produced, coal received 44 cents per megawatt hour, nuclear $1.59. Oil was not reported in these numbers since oil is hardly a factor in electricity production. However, oil benefits from a variety of tax subsidies for dry well expenses and royalty holidays dating from the $10-a-barrel oil days of the late 1990s, which the administration promises to rescind. At the same time in the same year, wind energy received public subsidy of $23.37 per megawatt hour; solar energy received $24.34. These numbers do not include the additional subsidies we taxpayers have been compelled to pay for wind, solar and biofuels through the stimulus plan, the 2010 budget and the 2011 framework budget. These subsidies help support 2 percent of today’s energy system. Their proponents promise to double and double again the amounts of subsidized supply from clean and green with no commitment to ending subsidies. That’s not a new energy system. Here’s the problem I have with what the administration and Congress are doing. They are frittering at the edges of the energy system, not even building a manufacturing base to sustain its growth, because it’s politically popular. Polls say bashing the energy industry gets votes. You don’t govern by promoting coal, oil, gas and nuclear when you just got elected berating them. Symbols trump substance. Meanwhile, our leaders ignore 93 percent of base energy — hydrocarbons and nuclear, which are aging rapidly and in need of major new investment — at their constituents’ peril. The nation needs its leaders to promote short-, medium- and long-term energy supplies from all sources and do what it takes to deliver. Beginning with the Nixon administration, we’ve had eight presidents and 18 Congresses who have promised energy independence and never delivered. Recent announcements on tripling loan guarantees for future nuclear construction are little more than sleeves off the vest. Loan guarantees are useless for unaffordable new nuclear investments, which have also just lost their future source of nuclear waste disposal. The administration torched $20 billion of our money, announcing its determination to forever close Yucca Mountain, Nevada’s national nuclear waste repository. After decades of build-out, just as the site sought license approval, an eight-week-old administration pulled the budget plug. Does anyone suspect the reason? Sen. Harry Reid of Nevada, the Senate majority leader, faces a tough re-election race in 2010; he is benefited by the energy secretary’s announcement, undoubtedly from orders on high, to shut down the nation’s only safe and reliable storage site. Now we’re appointing a blue ribbon panel to study what we studied decades ago and report out in two more years. Why not a blue ribbon panel to commoditize nuclear and reprocess waste to lower costs, so we can actually build more plants? As for hydrocarbons, the administration is proposing a series of demonstration projects to evaluate carbon capture and sequestration by 2016. Never mind that new coal leasing is all but dead, stopped in its tracks by the EPA. They’re kicking the can down the alley, while making headlines as if they’re doing something. Regarding other hydrocarbons, EPA regulation of fracking is being proposed, which will add time and cost to developing tight gas reserves. Offshore leasing for drilling is as stalled as it was when congressional and presidential moratoria precluded it for 30 years. But “clean and green” it is: the simplistic formula to make it look like we’re serious about producing more energy. It will produce votes, not material energy. It’s not enough and never will be. We’re headed for an energy abyss. Hofmeister, the former president of Shell Oil, is founder and CEO of Citizens for Affordable Energy. He also is the author of the book Why We Hate the Oil Companies: Straight Talk From an Energy Insider (Palgrave Macmillan, $27). Given the condition of our country’s energy system and the public policies that currently govern it, the nation will begin a new era by the end of this decade. By the year 2020, the age of the energy abyss will begin. Once it begins, it is sure to last at least a decade or longer. Hard decisions avoided and ignored over the past 40 years, together with another several terms of political leaders and policymakers kicking the can down the alley, will combine to ensure shortages of liquid fuel for transportation and electrons for everything electrical and electronic. (Texas may be exempted, other than having very high prices, thanks to local drilling, refineries and the Electric Reliability Council of Texas, or ERCOT, which operates the electric grid and manages the deregulated market for much of the state). Gas lines, outages of fuel and sky-high prices at the pump will besiege and enrage drivers and truckers who have no transportation alternatives. Ongoing brownouts and rolling blackouts are now inconveniences endured during ice storms and hurricanes or after thunderstorms. In the age of the energy abyss, they will be employed by electric system operators more frequently, and especially in the hot summer and cold winter months, as an alternative to otherwise shutting down the system to save it from self-destruction. Grass-roots Americans will ask themselves, How did this happen? What’s with this Third World, Venezuela-like problem? Who did this to us? Whom do we blame? Will it be the fault of electric utilities, oil, gas, coal, wind, solar, biofuels, hydropower, hydrogen, geothermal, nuclear or wave energy producers, each of which works for its investors? Will it be the fault of investors who put money only in energy projects that paid them a return? Will it be consumers who for more than a century have benefited from affordable and available energy and built their lives around it on the presumption that their energy purchases, votes and tax dollars ensured continuity of energy supply? Or will it be the combination of eight presidents since Richard Nixon, who in November 1973 promised “energy independence” within seven years, together with 18 Congresses, which likewise promoted energy independence but failed to deliver on their energy public policy promises? From the 1910s through the 1970s the great American energy system build-out occurred. Never in human history had so much financial and human capital gone into creating a ubiquitous and homogenous energy system that fostered the creation of the world’s largest economy, won two world wars for freedom and raised a standard of living that became the envy of the world. Energy was affordable and available. The shiver down the spine created by the Arab oil embargo in 1973 was the first shot across the nation’s bow that suggested perhaps the energy nirvana we enjoyed also carried risks. Today’s energy system is essentially a 40-plus-year-old legacy of what we built back then. Add 10 more years and we are headed toward a 50-plus-year-old legacy energy system that cannot carry on. It’s worn out. With no national energy policy, here’s the track record. In the past five years the nation’s electric utilities have shelved plans for more than 100 new coal plants because the barriers were too great to build them. They have ignored gasification of coal because they can’t get a high enough price to pay for the technology. More than 100 nuclear plants were built in the 1960s and ’70s. The last one built was finally commissioned in the early 1990s, having endured more than a decade of delay. Not a single new plant has been built since, and I can all but guarantee that another one will not be built or commissioned in this decade. Time marches on. Many nuclear plant licenses begin expiring in this decade. The nation has endured 30 years of congressional and presidential moratoria prohibiting offshore drilling across 85 percent of the nation’s outer continental shelf. While the law expired in 2008 and President George W. Bush took seven and a half years to lift the presidential moratoria, nothing has happened since then. Support for future drilling shows up in occasional words, not actions. For oil and gas companies to expand their operations into the nation’s reservoirs of untouched oil and gas resources they need approved leases, actions not words. Instead we “fritter at the edges” of our energy system by promoting subsidized wind, solar and biofuels, pretending to remake the nation’s energy system. Addressing 2 percent of our energy supply by promising to double it and double it again with subsidized funding does not make a new energy system. Meanwhile, 93 percent of our existing energy base, and the infrastructure that supports it, is aging faster than it is being maintained. The balance comes from old and silted dams. No new dams are planned. The world’s largest economy is energized by a precarious, aged, diminishing supply infrastructure. The most promising new supply, natural gas from tight formations, relies on fracking technology. Its prospect is shrinking and slowed by the threat of authorizing oversight from the federal EPA instead of states. China, meanwhile, commissions a new coal plant every week and licenses coal gasification technology for multiple purposes, including electricity production. It just bought $60 billion of Australian coal because it can’t produce enough itself. It is building dozens of nuclear plants with a goal of a hundred new plants in coming decades. China is the world’s largest builder of wind and solar systems, not only the installations but also the manufacturing plants to produce such systems. The American energy abyss will take hold of the country thanks to political leaders who make promises but not policy, who point fingers, but not at themselves. They have chosen the do-nothing path to avoid tough choices. They prefer partisanship and policy paralysis in spite of the nation’s needs. They are guided by the arrogance of incumbency, avoiding the risk of offending special interests. They make words of rectitude, not decisions to deliver the goods. Politics and energy are oil and water. They don’t mix. The nation’s energy abyss will be proof positive, if such is needed. The rest of the world actively promotes its core industries. It’s time we did too. Much is being said about the terrible financial returns and lack of economic growth in the “lost” decade that began the 21st century. Why should anyone be surprised? As a nation we’ve been driving toward this no-growth plateau for several decades. As manufacturing has shrunk, we’ve honored the gods of “rationalization,” “restructuring,” and the almightiest of all, “globalization.” Core industry after industry has orchestrated its own decline, facilitated by short-term managerial reward systems. The next decade could see negative growth thanks to our foolhardy fondness for “free market” philosophies that tell us it’s OK to export all our jobs. The U.S. is down to four world leading industries: entertainment, out of Los Angeles (heavily indebted to Democrats); information technology, out of the Bay Area (likewise); energy, out of Houston (heavily indebted to Republicans); and financial services, out of New York (indebted to both parties). That’s it, folks. We’re otherwise second- or third-rung suppliers across the range of manufactured products—except for biotech, a small industry—and we can still (mostly) feed ourselves. Even aerospace has suffered. Let’s acknowledge the parasitic legal industry’s role in eroding America’s manufacturing strength. Some argue that the U.S. leads in innovation and entrepreneurship. If so, where are the jobs and value creation? It wasn’t always this way. For the first three decades after World War II, the U.S. led the world in manufacturing. From mining to materials to mechanical, electrical and electronic products, from textiles to footwear, autos to airplanes, furniture to food, U.S. manufacturing filled our households with self-made products and elevated the standard of living for most to unpretentious comfort. Services grew out of the successful manufacturing base because we had it. Prosperity seemed endless until we started “rationalizing,” shipping jobs overseas to build supply chains that enlarged growth prospects everywhere but the country of origin. And while the U.S. worshipped the free market, especially unrestrained freedoms to cut labor, the rest of the world didn’t. Other countries saw the wisdom of protecting jobs and people. They erected barriers and social programs that hardly exist in the U.S., while adding government-sponsored manufacturing incentives. Services are just as vulnerable to the free labor market, only it’s called “outsourcing.” America needs manufacturing jobs for skilled, semi-skilled and low-skilled citizens. We need their wages circulating in the economy for sustained growth. As we look ahead, the current Democratic majority is locking the government’s incisors into the neck of two of our four industries: energy and financial services. The antihydrocarbon and antinuclear crowds are making it virtually impossible for the producers of 93% of the nation’s core energy to expand or grow (coal, oil, gas and nuclear) while helping venture capital friends in Silicon Valley expand 2%-3% of our energy base (wind, solar and biofuels) with virtually free taxpayer money. How long Houston can hang onto world energy leadership is being actively discussed in, yes, Houston. The financial services industry, in the aftermath of its inexcusable greed and manipulation of trust, is about to get regulated in ways that will drive it to impotence, sending the core strength of yet another historic U.S. industry elsewhere. Where? Probably not Europe, or Japan. More likely it’s China. So then there will be two. Two world-leading industries in the U.S., entertainment and information technology. For how long? Entertainment is ever more virtual and universal. China, Korea, India and Japan are after Silicon Valley’s infotech dominance day after relentless day. And those countries create the government policies that help and protect those efforts. The administration is worried about jobs in the runup to the fall elections. Every incumbent should be. Where to stimulate job creation should be as obvious as the cosmetic smile on an elected official’s face: manufacturing. Go where we’ve been. Since government is involved anyway, let’s shift it from disablement to enablement. Create manufacturing incentives like other governments do. Lower repressive corporate tax structures, accelerate depreciation, defer income and inventory taxes, tax abate existing and new jobs, pay for worker training, incentivize new, and the conversion of former, manufacturing sites. We’ve never systematically used government incentives to help U.S. industry compete across the board. It’s time we did, like everyone else. Use the unspent hundreds of stimulus billions to create millions of competitively priced manufacturing jobs in America. We’ve never had more people available, ready and willing to work. Let’s practice the “globalization” we taught everyone else. Mr. Hofmeister, former president of Shell Oil Company, is founder and CEO of Citizens for Affordable Energy, and author of “Why We Hate the Oil Companies: Straight Talk from an Energy Insider,” due out in May by Palgrave Macmillan. As an intended joke I asked a Congressman’s chief of staff in December 2008 whether she was working on the 2010 election yet. To my surprise she responded with the comeback, “How did you know?” Remember, we had just finished (seemingly) the longest election in our history and it had hardly had a chance to wind down. Yet this Congressman was already girding for the next election, working on the messaging, going over the finances, and steering his staff’s thinking toward the future. Two year terms can be an eternal political damnation or “Happy Days,” depending on how an elected official prepares for the future. Four year presidential first terms are sustained campaigns; second terms are two years of legacy building and two years of wind down. Six year term senators can’t coast for any length of time. Tens of millions of dollars have to be raised; each week is a new milestone where messages, friends and their contributions matter. I call “political time” the two year cycle between elections when every handshake, speech, vote and smile matters. The two year candidates never stop campaigning, the four and six year candidates guide their own messages and decisions based on their reading of the ongoing two year dynamics so they’re ready in the run-up to their election cycle. “Political time” success is defined by winning elections. It requires successful campaigning and a good gut for decisions in the moment. It never stops and isn’t over ‘til it’s over, but then you’re out. Energy executives meanwhile are delivering energy today from projects that began ten, twenty, thirty, forty and even fifty or more years ago. They keep them going as long as they can make a return to their shareholders and ensure the safety of the facilities. Their days and weeks are filled with project reviews and analyses of alternatives to decide which projects best fit future energy portfolios years and decades into the future. Investments and costs are continuously reviewed against oil and gas or coal price premises to determine what rates of return might be possible against short, medium and long term supply/demand forecasts. Supply chain decisions for new leases, power plants, platforms, turbines, castings and ships must be debated or made for the next decades of project flow. I call “energy time” the decades of project analysis and execution that deliver future energy. “Energy time” success is defined by deliberation, analysis, capability in your organization, long relationships, knowledge and even mastery of technology. Gut decisions lead to short tenure; sound decisions lead to long term success. Politicians and energy executives live in completely different worlds. There is nothing compatible about what they do or how they do it. They speak untranslatable languages to each other, think and work in totally opposite time dimensions, the here and now versus the future, and are accountable for incompatible objectives, winning votes versus risking popular resistance. Politicians are accountable for winning elections; executives are accountable for providing energy. One promises, the other delivers. “Political time” and “energy time” are as incompatible as oil and water. Yet, unbelievably, politicians govern energy executives and decide what they can and can’t do. “Political time” energy policies are sapping the nation’s energy. We’re going backwards not forwards. Politicians, since Nixon first declared energy independence in 1973, have run for office on its promise. When Nixon was president we imported 30 percent of our crude oil from exporting nations; forty years later, 8 presidents and 18 congresses later, politicians have delivered political time results. We now import 65 percent of our crude oil. “Political time” policies make things worse. It’s not enough that politicians have clamped down on energy companies for decades to keep us from producing our own domestic energy, they are now working on how best to strangle the remaining strength of our legacy energy system. “Big Oil,” “Big Coal,” and “Nuclear Power” are the bad boys of the energy patch. Their so-called “excessive profits,” “filthy ways,” and “terrorist risks,” are being demonized, taxed, and controlled by politicians in “political time.” They are denying new leases and permits, stripping away decades of tax policies that stabilize energy production through economic cycles, and defunding the only national nuclear waste site, after spending $20 billion on it, to help the 2010 re-election prospects of the senate majority leader. Today’s majority party politicians run for office to govern our energy future with all the knowledge and understanding of gifted amateurs, beholding to clean and green ideologues out to promote their special interests, while catering to the line-up of venture capitalists seeking taxpayer funds for the next “big thing” in energy. In case you haven’t noticed we’re experiencing a crusade to diminish the companies that deliver 93 percent of daily base load energy, while we ignore the 5 percent that comes from hydropower, and chattily, happily, smilingly promote and subsidize 2 percent of our energy supply from wind, solar and biofuels, which at best incrementally, and expensively, add to our energy mix. “Political time” energy sapping is taking us perhaps unintentionally but continuously to an unprecedented energy abyss. Their track record proves we can’t count on politicians. Grassroots citizens are the nation’s only hope for the future. What they know and how they respond to this knowledge is crucial to the nation’s security, economic well-being and lifestyle promise. I founded Citizens for Affordable Energy and wrote Why We Hate the Oil Companies: Straight Talk from an Energy Insider (Palgrave Macmillan 2010) to provide the facts, the non-political reality, and a pathway to future short, medium and long term sustainable energy solutions. We have more energy in this country than we will ever need. We should not restrict its production to keep prices high to reward politicians’ “political time” energy friends. We need more energy from all sources. “Political time” restrictions prohibiting “energy time” security are wrong. Citizens need to set the politicians straight. They work for us, not the other way around.